On Feb. 3, Wallows performed at The Observatory Orange County with Precious Kid and The Downer Party opening. As The Downer Party walked out for their set, I realized the audience was comprised mostly of people under twenty, a lot of them screaming tween girls. Despite this, the night turned out to be one of the most fun concerts I’ve ever been to. The audience then got what it was waiting- and chanting- for. As the Wallows’ light up palm tree set was turned on, high pitched screams filled the room. When the members sauntered out in matching-but-not-matching floral shirts, the screams only intensified. I had never seen The Observatory Orange County so empty for a headliner, but the screams made up for the lack of crowd. The unexpected upside to less people was the extra room for dancing- which I made full use of! The Wallows followed an unreleased song that featured an extremely well-received trumpet solo with their extremely popular “Sun Tan.” As fans heard the first few notes, the yells echoed throughout the room, strengthening when co-frontmen Clay Jensen (of “13 Reasons Why” fame) and Braeden Lemasters smiled or glanced at the crowd. Both insisted that the group has new songs coming out “sometime soon” throughout the show. They played a heartfelt cover of The Smiths’ “This Charming Man” before telling the crowd to stay safe out there and launching into their people pleasing song “Pleaser,” which ignited a raucous mosh pit and some crowd-surfing. Wallows left the stage after receiving a banana from a dedicated fan and returned after a chant of “ONE MORE SONG” shook the building. Braeden played a solo, “1980s Horror Film,” while his fellow band members lounged on the stage before they all thanked the crowd for coming to the biggest show they’ve ever played. They finished the concert with a cover of “Blister In The Sun” that morphed into a “Boys Don’t Cry” cover with Precious Kid’s Dorsey returning to sing along. Then the song returned to the cover of “Blister In The Sun.” After asking fans to drive home safe, all band members blew kisses and threw guitar picks into the crowd as they left the stage. 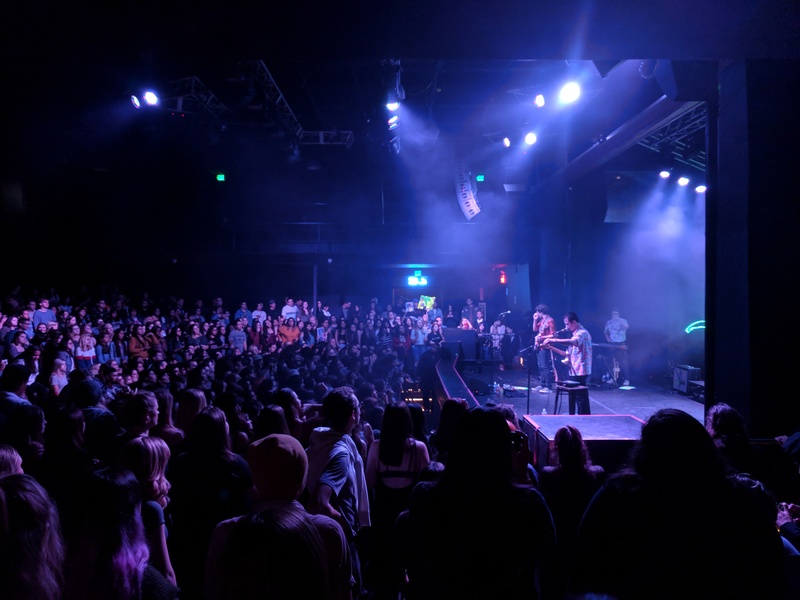 Altogether the three bands have only released a handful of songs and didn’t manage to sell out the venue, but the Wallows’ strong fan base made the concert a memorable and enjoyable one. The complete lack of pretension in a crowd that didn’t care what they looked like was refreshing and will be hard to beat with any other band’s audience.